Perhaps slightly less well known than some of the really big names in world of online gaming, Zinger Bingo is slowly but surely making waves and welcoming more and more new customers by the day. Powered by the well-known Dragonfish network that also works with sister sites such as Diva Bingo and Loony Bingo, this site ticks all the boxes and in this Zinger Bingo review we’ll tell you all you need to for you to be able to make up your own mind on whether or not to sign up, log in and start enjoying all the perks of this increasingly popular site. Firstly, the website instantly grabs your attention with its lime green colour scheme and tropical theme throughout. Whether you’re playing on the desktop version of the website or the Zinger Bingo mobile platform, you can’t help but be captivated and intrigued. Far from just looking the part, the website is extremely responsive and easy to use. Everything is divided up into subsections and additional pages that make finding what you’re looking for extremely simple and hassle-free. There is no trawling through endless pages and everything you need including bonus codes is ready and available with just a couple of clicks. There is also a large banner that runs across the top of the screen that showcases all the latest offers and promotions, which means you don’t have to delve deep into the website to find the best deals. Opening an account is also quick and easy, in fact you can get your very own Zinger Bingo login in around two minutes by following the instructions given. So the website gets a big thumbs up from us, but what’s really important are the Zinger Bingo promo code for April 2019 offers for new customers, and ongoing promotions for existing customers, that will most likely determine whether or not you choose to sign up. Well, you’ll be happy to hear that as a new customer you will receive a staggering 700% bonus on your first deposit. In a similar offer to that of sister site Hunky Bingo, when you deposit £10 you will receive £70 worth of bingo tickets, as well as 10 free spins to sweeten the deal. Sound too good to be true? Well it’s not, but let’s break down the deal for you so you know exactly what you need to do and exactly what you’ll be getting. So firstly, you will need to sign up and then log in to your account. When you deposit £10, be sure to use the promo code ZINGER and you’ll be rewarded with four tickets worth £40 which will be credited to the next Big Bang game which is played on the 10th of every month. In addition to this, you’ll also get 60 tickets worth £30 that you can use on Street Party bingo. As a juicy added extra, you will also receive 10 free spins on the popular slots game ‘Fluffy Favourites’. If that wasn’t a good enough reason to sign up, we think this will sway you. All winnings from the bingo tickets and the free spins will be credited to your real money balance! How often is it that a site pays winnings in cash? More often than not, winnings are added to a ‘bonus’ balance that you have to wager what seems like an endless amount of times before you can actually reap the rewards. Therefore, in regards to the Zinger Bingo promo code and welcome offers for new customers, we feel this is definitely one of the best around. Another thing we love about Zinger Bingo is the fact that it doesn’t neglect its existing customers. It’s all good and well attracting new ones with generous welcome bonuses and sign up offers, but keeping the customers you already have is just as, if not more important. 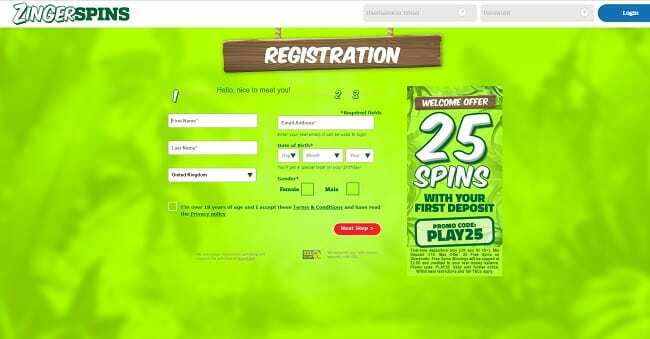 This brand is constantly updating their promotions and users can currently get free spins every time they deposit, as well as being able to be part of a rewarding loyalty scheme. As you work your way up the levels, the incentives get better and better, including incentives such as free spins, free bingo and even cashback on your losses. So, the website is great and the offers and promotions are even better, need we say anymore? So you’ve signed up, got your Zinger Bingo login and now you’re ready to play. So where do you start. Well, we’re assuming that the fact you’re even reading this Zinger Bingo review means you’re a big fan of these online games, so let’s start there. As you may expect, there are different varieties of bingo to choose from and different rooms in which to play them, including the classic 90 ball version, as well as 75 ball. Rooms include the Wonky Bingo room, the Guaranteed Win room (we like the sound of that one! ), Free Bingo (that too!) and Last Call bingo, for the nocturnal amongst us that like to play after hours. If you fancy a break from the bingo, why not try your luck on one of over 300 of the best slots games available. Finding them is easy, simply make your way to the dedicated slots page and here you’ll find all that is on offer, laid out in a grid format in clear rows of four. Even after just a quick scan, we couldn’t help but be impressed when we stumbled across the likes of Gonzo’s Quest and Jack Hammer, as well as licensed titles such as Deal or No Deal, Clash of the Titans and Bruce Lee. One slight negative, in terms of content, is the lack of some casino and table games. However, this site doesn’t claim to be an online casino, it is simply a bingo site with a healthy selection of slots as an added bonus. This brand also has Zinger Spins, have a look at what they offer if you like this site. So now for the slightly less interesting but equally important information. You’ll be glad to know that the website accepts a whole host of deposit methods, including the most common method of paying with a debit or credit card. This site currently accepts all the usual suspects, including Visa, Visa Debit, Mastercard and Maestro. For those of you who prefer to pay by E-wallet, fear not, you can also deposit with PayPal for bingo, Entropay, Paysafe bingo deposits and Neteller. In terms of amounts, the minimum deposit is £5, which is refreshing and it seems as though £10 is the favoured minimum amount amongst the really big names. You can request a withdrawal up to ten times per day and the minimum you can cash out is £35, which seems a little high, but it is definitely not enough to put us off this site. As is pretty standard across the board, you can expect to wait between 3-7 working days for your withdrawal to be processed. In 2017, we’d be surprised if a major online bingo site didn’t offer mobile play of some sort. However, it’s not just about providing a mobile platform, but providing a good one. The Zinger Bingo mobile site is just as user-friendly and responsive as their desktop version, and they have opted to keep the same lime green theme throughout. Navigation is seamless and you can be where you need to be on the page with a few swipes and a couple of clicks, without any annoying lag. Some may bemoan the fact that there is no Zinger Bingo app, but why would you need one? Simply type the URL into the bar at the top of your chosen browser and you’re ready to go. So what devices can you use? Well we’re pleased to say that this site looks and works great both on a smartphone or tablet, be it Android or iOS. One of the reasons this site makes a successful transition to the mobile platform is because of its affiliation with the Dragonfish network. They provide software to some of the biggest names in the business and remain successful as they constantly strive to offer dynamic content and a user-friendly interface. All of the same promo codes and bonus offers can still be used on mobile so you won’t be missing out on any top features. Below is a list of sites which fall under the Dragonfish software. All in all, through this Zinger Bingo review we found it to be a fun and refreshing online gaming site. The look of the website itself is bright and colourful and it definitely has the content and usability to back up its pleasing aesthetics. But what really sold it to us is the incredibly generous promo code bonus for new customers, and of course, the fact that winnings from your welcome offer are paid as cash and not ‘bonus’ money is a definite clincher. As we mentioned previously, this offer may not be around forever, so be sure to get it before it’s gone.